It takes something very special to steal a show from three world title fights, all in one night, all on one card. And for that something special to come from a 12 fight novice is something even more impressive. Yet, special and impressive are understatements in regards to just how good Anthony Joshua looked on the Rule Britannia Matchroom Boxing card last Saturday in London. Joshua put in a performance so devastatingly good many think he may be one of the very best in the division already, just 18 months into his professional career. Some will point out that his opponent, 35 year old Kevin Johnson, was there for the taking, having lost four of his last five fights. However, he was losing on points to fighters such as Dereck Chisora, Tyson Fury and Manuel Charr, all three of whom are far more experienced than Joshua and considered among the best heavyweights in the world today. It should also be noted it was not too long ago that Johnson himself was considered one of the best heavyweights in the world, someone that Vitali Klitschko only beat on points. A wily, defensive fighter, Johnson had never been stopped prior to the fight last weekend. So it sent shockwaves through the boxing world when Joshua made him look like a low-end journeyman by demolishing him in less than five minutes, in the manner of some Lennox Lewis/Mike Tyson hybrid lab experiment gone right. Fighting violently but calmly, never seeming wild or overly anxious, Joshua is a sight to behold right now in a boxing ring. The boxing world is seeing the emergence of a genuine superstar. Joshua is someone fans cannot wait to see fight. His demeanour, his character and most of all his fighting style sell like beer in a pub. Like any boxer of his status and experience, his opponents have been picked carefully thus far but it is a myth to say he has had easy pickings. The likes of Muhammad Ali and Wladimir Klitschko had not fought two former world title challengers in their first 13 fights. It is also worth noting that Joshua fought Jason Gavern in his 11th fight. Current world champion Deontay Wilder fought Gavern in his 32nd fight and won the title in his 33rd fight. The fact Joshua is simply destroying everyone he faces has people immediately concluded he needs to face the likes of the aforementioned Wilder, Fury or Klitschko next. However, at just 25 years old and having had a really short amateur career belying his achievement of winning an Olympic Gold medal, it is simply unfair to say Joshua must test himself against any of the elite. This is because despite what is said about the heavyweight division, it is currently in the best state it has been in for over 10 years. There are fighters out there that can test Joshua in ways we have not seen so far. Joshua has never been properly hit yet, nor has he had to chase a more nimble fighter around to test the stamina in his hulking 6ft 6in frame. Who can do that to Joshua except Wilder, Fury or Klitschko? Maybe no one, or maybe any of the following boxers. The first thing Joshua needs to do is prove he really is the best of Britain’s up-and-coming heavyweights, as there are at least three people that can claim he is not. Two years ago David Price (19-2) was near enough where Joshua is right now; undefeated and knocking everyone out in brutal fashion. Then the 6ft 8in Olympic bronze medallist stepped up massively against former world title challenger Tony Thompson and was knocked out, two fights in a row. Whilst there have always been questions about his chin since his days as an amateur, there is nothing wrong with Price’s power, and with his size, he should be the first person to be able to give Joshua back some of what he is used to dishing out. Less tested but still as dangerous are Tyson Fury’s young cousin, Hughie Fury (15-0) and Joshua’s old rival, Dillian Whyte (14-0). Hughie Fury is the same size as Joshua and would provide a real chess-match for Joshua with his rangy style, although at 20 years old he does lack strength and experience right now. Whyte seems the best match for Joshua currently, as he already beat Joshua as an amateur and even put him down. Although he is the smaller man, Whyte would not be afraid to go after Joshua, making it exactly the kind of fight we need to see. It is only through luck that the two have ended up at the same stage of their careers again, as Whyte only recently has been allowed to box after a two year ban for using performance enhancing drugs. As well as domestic challengers to fend off, prior to fighting the best in the world Joshua needs to overcome a live veteran. 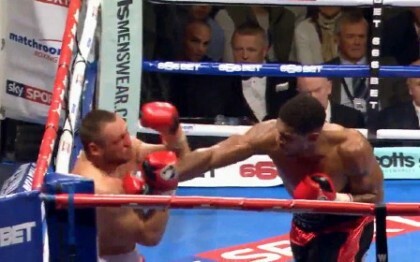 As an opponent, Kevin Johnson was only there to attempt to take Joshua more rounds than he is used to going. But there are a host of veterans still dangerous enough to really test him. People like Antonio Tarver (31-6). Tarver would be the first real tricky southpaw Joshua will have faced. Even though he is 46 years old (! ), Tarver is a boxing master and has kept his skills ticking over with one fight a year over the last five years. Only last December he picked up a great knockout win against a good opponent. Also, David Price’s conqueror Tony Thompson (40-5) is another southpaw in his 40s (43) that is still beating contenders and also has size to match Joshua at 6ft 5in. Finally, 38 year old Steve Cunningham (28-7) has shown he is still a test for any heavyweight and could have even been fighting for a title had he not lost a very controversial points decision to undefeated Ukrainian Vyacheslav Glazkov in March. Not to forget, just two years ago Cunningham looked on the verge of knocking out Tyson Fury, before Fury turned things around and scored a come from behind knockout win. All three Americans would not be intimidated by Joshua and all have shown they still have the ability to beat some of the best heavyweights today. Just outside the names that have been around the top 10 of the division for the last five years or so are a new selection of heavyweights that are in their own way looking as dangerous as Joshua is. At the top of this list and not too far of a title shot is Lucas Browne (22-0), the bulky Australian promoted by Ricky Hatton. Although he lacks speed and genuine skill, he has raw power (19 knockout victories thus far) and a systematic style that has brought him wins against some good fighters. 42 year old Amir Mansour (22-1) is an American making up for lost time, having had his career stalled by an nine year prison sentence in 2001, and then another 14 month one for parole violation in 2011. Despite his age, Mansour is in fantastic shape and has a speed advantage over most heavyweights in the world today. Someone that is not always in great shape but is still a real threat to any heavyweight today is Andy Ruiz Jr (24-0). The Mexican may look podgy but he has a classy ability to set up shots that have seen him remain undefeated despite being the underdog in many of his fights. At 25, he is only getting better too, although he has not fought this year so far. Finally, there is Joseph Parker (13-0), New Zealand’s next heavyweight hope. A superb athlete, Parker has been tested against decent opposition thus far and has come through with flying colours. His team have been unafraid about calling out much more experienced and higher ranked fighters, such as the aforementioned Browne, showing they believe they have a real talent on their hands. On paper, Joshua against any of these fighters would be a 50/50 fight right now. In conclusion, taking on lumbering Eastern European giants may get him more rounds, or taking any of the dozen out-of-their-prime-and-rarely-in-good-condition heavyweight names still fighting will only do so much. As shown above, there are some serious tests left for Joshua but such is the level of his potential, it would not be surprising to see him blow away any of them. Nevertheless, there is no fast-track to greatness. Joshua needs these kinds of tests so we know when he is really ready for the best. However, his self proclaimed hype train is picking up speed and it is unlikely to be too long before it arrives at its designated destination. Until then, we can but sit back and enjoy the ride. Next boxing news: Michael Katsidis returns home to be by Brendon Smith’s side.